The scriptures talk a lot about having a broken heart, and when the phrase is used it is talked about as the sacrifice we can offer to our savior. A broken heart. We know that the atonement covers the pain we feel, it can heal our broken hearts. It can give us the comfort of the Holy Ghost and peace that comes only through the atonement of Jesus Christ. Yet, I’ve read that phrase before with a broken heart feeling as if I was drowning in the pain there sometimes seemed to be a gap that I didn’t understand between the pain and the promise of comfort. The key is in the second half of the phrase. We must also have a contrite spirit. To be contrite means to feel sorrow or remorse over a sin or shortcoming. (source). Repentance is the bridge necessary to go from the pain of a broken heart to the peace of the atonement. Repentance is necessary to balance justice and mercy. 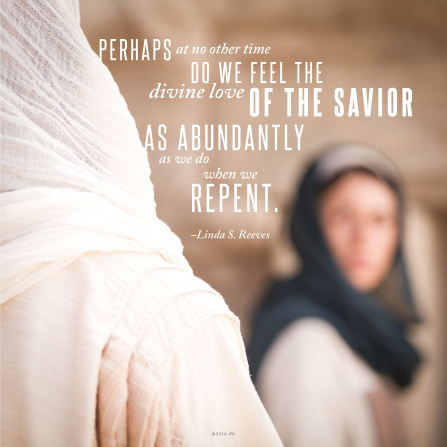 Repentance is how we “opt in” to the atonement that is ready for us to use. Think about it – if the Lord applied the grace and healing of the atonement without us choosing it, it would void our agency. When we show the Lord our willingness to repent we are telling Him that we want his help, that we are choosing his help. When we come to the Lord with the sacrifice of both a broken heart and a contrite spirit he is able to generously apply the atonement to our lives. That may not mean that circumstances change, but our ability to bear them will. Nor is it a promise that we will never experience heart break again. But we will have the power of grace in our lives which will give us assistance and strength far beyond our own means. The Holy Ghost is able to more consistently be our companion and we will be better able to receive personal revelation and the mysteries of God (including what he wants for us in our life) will be unfolded to us step by step. The broken heart seems to come naturally to us, but the contrite spirit we have to work towards, and at times it is a lot of work, but it is worth it every time.